What is it that makes flowers like Sweet Avalanche and Cloni Hanoi so popular? 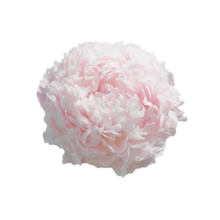 If you ask us, it must be that beautiful pale pink colour of the petals. Paeonia Sweet Sixteen has that same enchanting colour. This peony variety will do very fine on parties, weddings and baby showers; Sweet Sixteen is guaranteed to put you in a a summery mood! Paeonia Sweet Sixteen is a double bomb peony. The flowers are filled with thousands of petals, some white, but almost all of them pale pink. The flowers can grow to be about 17 cm wide, similar in size to the blooms of Monsieur Jules Elie. Sweet Sixteen blooms in mid-season and emits a wonderful fragrance. Paeonia Sweet Sixteen was bred by Carl G. Klehm.